Tourism is a leading sector that became the foundation of the economy in Indonesia. As a leading sector, tourism plays an important role in increasing foreign exchange and expanding employment. Therefore, the government is focusing the tourism sector through marketing communication activities conducted by Kemenpar, one of them by using Wonderful Indonesia. Wonderful Indonesia is currently considered to have successfully promoted Indonesian tourism abroad. Because of the success, the researcher is interested to research about marketing communication planning conducted by Kemenpar by using qualitative approach and deep interview method. 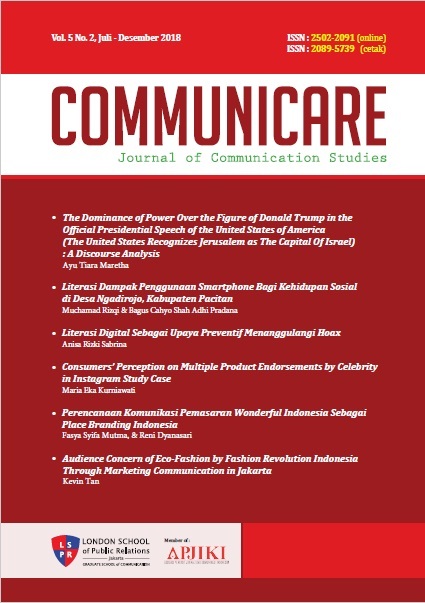 The results of this study indicate that Kemenpar performs all marketing communication planning steps covering three key resources, situation analysis, objectives, strategy, tactics, implementation and control that can support Indonesian place branding by fulfilling ten components in place branding. The findings in this research are Branding Advertising Selling (BAS) strategy which is always used for every marketing communication activity. In this strategy Kemenpar not only branding Wonderful Indonesia, but also tried to sell Indonesia tourism destinations. MUTMA, Fasya Syifa; DYANASARI, Reni. Perencanaan Komunikasi Pemasaran Wonderful Indonesia Sebagai Place Branding Indonesia. Communicare, [S.l. ], v. 5, n. 2, p. 61 - 80, jan. 2019. ISSN 2502-2091. Available at: <http://journal.lspr.edu/index.php/communicare/article/view/38>. Date accessed: 18 apr. 2019.